Derry 1-8 Mayo 0-4 (Ballinascreen, 1/2/1976). MAYO: I Heffernan; J O’Mahony; S O’Reilly, TJ Farragher; G Feeney, J Gallagher, M Higgins; E Brett, P Corrigan; E Webb (0-1), R Bell, H Gavin; T O’Malley (0-3), J Burke, G Farragher. Subs: G Conroy for Higgins, JP Kean for Brett, W McGee for Gavin. RELEGATION PLAY-OFF: Mayo 3-13 Offaly 2-7 (Dr Hyde Park, 7/3/1976). MAYO: I Heffernan; J O’Mahony, D O’Mahony, TJ Farragher; G Feeney, J Gallagher, M Higgins; A Egan (0-1), P Corrigan; E Brett (0-1), JP Kean (0-3), R Bell (0-2); T O’Malley (1-5), W McGee (0-1), W Fitzpatrick (2-0). FIRST ROUND: Mayo 0-11 Leitrim 0-11 (Fr O’Hara Park, Charlestown, 23/5/1976). MAYO: I Heffernan; D O’Mahony, J Timoney, J Gallagher; G Feeney, C Moynihan, M Higgins; F Burns, A Egan; R Bell (0-2), JP Kean (0-2), S Kilbride (0-3); G Farragher (0-2), M Sweeney, W Fitzpatrick (0-2). Subs: P Dickson for Fitzpatrick, J Farragher for Burns, E Brett for Bell. FIRST ROUND (REPLAY): Leitrim 2-8 Mayo 0-10 (Pairc Sean Mac Diarmada, Carrick-on-Shannon, 30/5/1976). 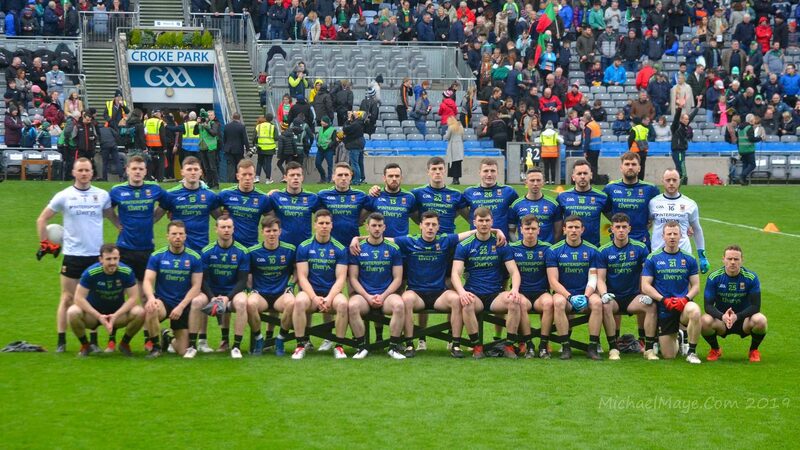 MAYO: I Heffernan; S Sweeney, J Timoney, J Gallagher; G Feeney, C Moynihan, M Higgins; A Egan, P Corrigan (0-1); R Bell (0-1), JP Kean (0-4), S Kilbride (0-1); W Fitzpatrick, M Sweeney (0-1), G Farragher (0-1). Subs: M Dixon (0-1) for Fitzpatrick, E Brett for Kean, F Byrne for Higgins. Sligo 1-7 Mayo 1-11 (Tubbercurry, 10/10/1976). MAYO: JJ Costello; G Kirrane, J Timoney, P Cunningham; G Feeney (0-2), J Gallagher, J Nally; P Corrigan, A Egan; G Farragher (0-1), JP Kean (0-1), A O’Connor; W Fitzpatrick (1-0), P Dixon (0-4), J McGrath (0-1). Sub: R Bell (0-2) for O’Connor. Mayo 1-15 Antrim 1-11 (Ballyhaunis, 24/10/1976). MAYO: JJ Costello; G Kirrane, J Timoney, P Cunningham; G Feeney (0-1), J Gallagher, M Collins; P Corrigan, A Egan; R Bell (0-2), JP Kean (0-2), G Farragher; J Burke (0-3), P Dixon (0-5), W Fitzpatrick (1-1). Sub: S Weir (0-1) for Corrigan. Roscommon 2-7 Mayo 1-12 (Castlerea, 7/11/1976). MAYO: JJ Costello; G Kirrane, J Timoney, P Cunningham; G Feeney, J Gallagher, M Collins; A Egan, S Weir (0-2); R Bell (0-2), JP Kean (0-6), G Farragher; J Burke, P Dixon (0-1), W Fitzpatrick. Sub: T O’Malley (0-1) for Fitzpatrick, H Gavin (1-0) for Farragher. Tyrone 2-12 Mayo 0-9 (Dungannon, 21/11/1976). MAYO: JJ Costello; G Kirrane, J Timoney, B Breslin; G Feeney (0-1), J Gallagher, M Collins; A Egan, S Weir; R Bell, JP Kean (0-1), T O’Malley (0-1); J Burke (0-1), P Dixon (0-4), J McGrath (0-1). Subs: H Gavin for Gallagher, P Corrigan for Bell. Mayo 2-11 Derry 0-7 (Fr O’Hara Park, Charlestown, 5/12/1976). MAYO: JJ Costello; G Kirrane, J Timoney, B Breslin; G Feeney, C Moran, M Collins; A Egan, S Weir (0-1); T O’Malley (0-4), JP Kean (1-0), R Bell (0-1); W Fitzpatrick (0-5), J Burke, J McGrath (1-0). Subs: H Gavin for Bell, G Farragher for Fitzpatrick. Sligo 1-5 Mayo 2-6 (Corran Park, Ballymote, 2/5/1976). MAYO: J Cuddy; G Kirrane, J Timoney, J Gallagher; H Gavin, D Conway, J Nally; A Egan, E Brett; K Geraghty (0-2), M O’Brien, T Moran; P Dixon (1-0), J Burke, J McGrath (0-2). Subs: P Mohan (1-2), W Nally. SEMI-FINAL: Leitrim 2-3 Mayo 0-12 (Pairc Sean Mac Diarmada, Carrick-on-Shannon, 9/5/1976). MAYO: J Cuddy; G Kirrane, J Timoney, J Gallagher; H Gavin, D Conway, J Nally; A Egan (0-1), E Brett; K Geraghty (0-5), M O’Brien (0-1), P Mohan (0-2); P Dixon, J Burke, J McGrath (0-3). FINAL: Mayo 1-8 Galway 0-2 (James Stephens Park, Ballina, 11/7/1976). MAYO: J Cuddy; G Kirrane, J Timoney, J Gallagher; H Gavin, D Conway, J Nally; A Egan, E Brett; P Burke (1-1), J Burke, P Mohan; K Geraghty (0-3), P Dixon (0-2), J McGrath (0-2). SEMI-FINAL: Kerry 1-12 Mayo 2-7 (Austin Stack Park, Tralee, 15/8/1976). MAYO: J Cuddy; G Kirrane, J Timoney, J Gallagher; H Gavin, D Conway, J Nally; E Brett (0-1), M Collins; P Burke, J Burke (1-2), P Mohan; K Geraghty (0-3), P Dixon, J McGrath (1-1). Subs: A Egan for P Burke, T Kearney for Conway, A O’Connor for Mohan. PRELIMINARY ROUND: Mayo 1-12 Leitrim 0-9 (Ballyhaunis, 27/6/1976). MAYO: E Lavin; T Reilly, S Durcan, B Gilligan; K McHugh, T Munnelly, E McLoughlin; WJ Padden, G Hassett (0-1); P O’Brien (0-2), L Morahan, J Kean (0-3); M Griffin (0-2), J Lyons (0-3), P Burke (1-1). Subs: T Kearney for Hassett. SEMI-FINAL: Galway 0-18 Mayo 2-7 (Dr Hyde Park, 4/7/1976). MAYO: E Lavin; B Gilligan, S Durcan, T Reilly (0-1); T Munnelly, K Earley, E McLoughlin; WJ Padden, G Hassett (0-3); L Morahan (0-1), J Kean (2-0, two penalties), P O’Brien; M Griffin (0-1), J Lyons (0-1), P Burke. Subs: P Reilly for Morahan, F Joyce, for Griffin, K McHugh for Munnelly.